(Nanowerk News) The amount of data that flows over the internet has exploded in the last decade. Whether people are watching cat videos, streaming movies, or uploading vacation photos to social media sites, they are demanding ever higher performance from the optical networks that are the physical foundation of the World Wide Web. Yet the path toward an even faster internet has been hindered by energy consumption and cost per optical component, said Wei Shi, Assistant Professor, Université Laval in Québec, Canada. Shi and his colleagues have designed a tunable filter -- an important component of high-capacity optical networks -- that should save both money and energy because it can be readily integrated onto a photonic chip (Optics Letters, "Widely bandwidth-tunable silicon filter with an unlimited free-spectral range"). The device's performance is comparable to the best bench-top systems, but at a fraction of the size and cost. The filter's tuning span, which is a measure of how well the device can adjust to fluctuating data demands, is the widest ever demonstrated on a silicon chip. Additionally, the device has an unlimited free-spectral range, meaning it can operate over any range of frequencies, and shows excellent performance metrics in other standard measures of filter quality, including very low insertion loss and in-band ripples, low crosstalk and small delay variation. "The most exciting aspect is that these record-breaking results were achieved on the silicon photonic platform," Shi said. "This indicates that the filter can be readily integrated with other well developed components for a novel integrated system. It's like finding the missing piece in a puzzle." The optical spectrum is a limited resource -- as internet traffic has increased dramatically, bandwidth has become more precious. To maximize the power and cost efficiency of communication, optical networks must be able to flexibly allocate bandwidth, giving each customer only what they need at any given time. "Compared to traditional networks where optical resource allocations are predetermined and fixed, flexible networks enable orders-of-magnitude higher data volumes per optical carrier and throughout the entire spectrum," Shi said. 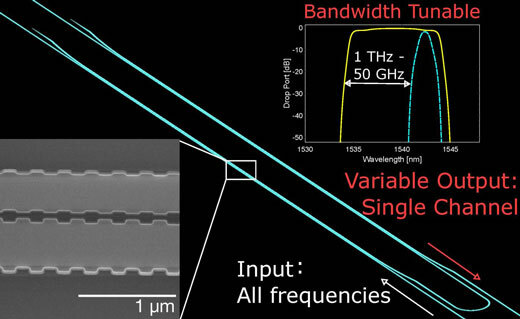 The tunable filter that Shi and his colleagues designed and tested has a tuning span of 670 GHz, much greater than the approximately 100 GHz span other silicon-based filters have achieved. The researchers believe that with further modification their device's tuning span can be even further extended, to 1 THz. "Higher capacity optical networks affect consumers in a big way," Shi said. The next-generation of internet technology could mean videos that stream in 3D or 360 degrees and vast amounts of cheap cloud data storage. "Think about the improvements to internet services in the past 10 years," Shi added. "We can now easily call each other with video, send large files almost instantly and generate the news feed of your 1000 friends and subscriptions in milliseconds. This is only the beginning."